Huge quantities of oxygen have been spotted in the gaseous halo of Comet 67P/Churyumov-Gerasimenko, with astonished researchers saying that the “big surprise” challenges current models about the creation of our Solar System. A scientist Andre Bieler of the University of Michigan, said “We believe this oxygen is primordial, which means it is older than our Solar System,” The oxygen molecules spotted by the European Space Agency’s Rosetta spacecraft in the comet’s halo must have been present “before or at” the creation of our solar system, Bieler said. The discovery defies common existing theories about the formation of our solar system about 4.6 billion years ago. According to Kathrin Altwegg of the University of Bern, researchers had earlier ruled out the existence of oxygen on comets, because it reacts easily with other atoms, and researchers “never believed that oxygen could ‘persist’ for billions of years,” Kathrin Altwegg is co-author of the study issued in the journal Nature on Wednesday. The oxygen was spotted by the ROSINA mass spectrometer, one of the tools aboard the Rosetta spacecraft that has been examining the comet since August 2014. After it come across Churyumov–Gerasimenko on August 6 2014, Rossetta’s Philae lander became the first ever spacecraft to land on a comet nucleus back in November 2014. To exclude any false-positive data of the new discovery due to imaginable instrumental defect, the researchers checked oxygen levels at various different distances from the comet. 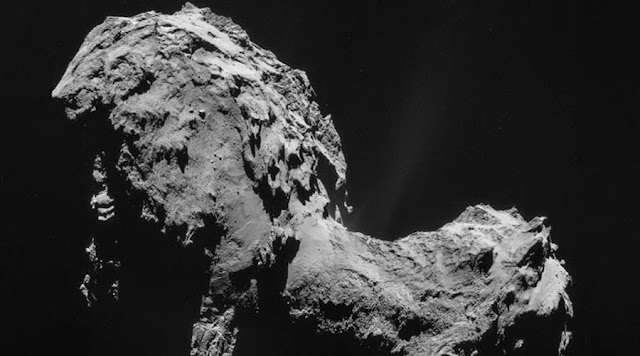 More oxygen was spotted closer to the comet, and as the spacecraft soared further away, it discovered less oxygen. Moreover, the ratio of water to oxygen in the 67P atmosphere stayed constant over months that ROSINA was gathering measurements. Oxygen is currently the fourth compound spotted by ROSINA while examining 67P. Earlier the researchers announced the detection of water, carbon monoxide and carbon dioxide. More to add here, this is the third time that oxygen molecules have been discovered in the Solar System outside the Earth's atmosphere. The other findings of oxygen were made on the icy moons of Jupiter and Saturn.